While most of us are wondering how she manages to keep her calm while raising two boys, teaching and mentoring scores of other students as a professor, keeping up the decorum on the two extremely popular book lovers’ groups on Facebook that she runs, and overseeing a resort, Tanu is no doubt a super mom. 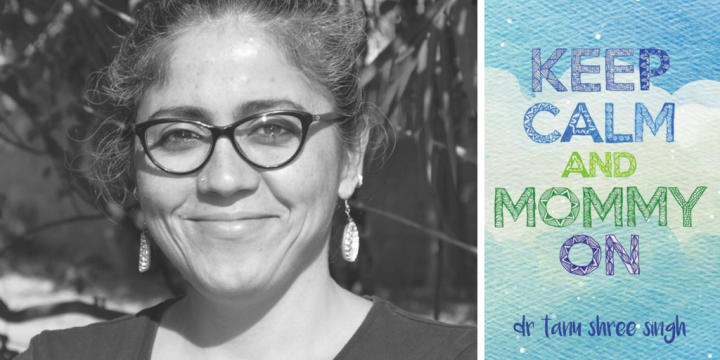 Tanu prefers to describe her book as a collection of personal experiences and observations, rather than a ‘parenting book’ and deems calling any parenting approach as a mistake to be a show of arrogance. ‘Keep Calm and Mommy On’ is a book that nudges parents to consider important questions and encourages them to take a long-term view of their convictions about raising the next generation. Why did you decide to write a parenting book? It just happened! The book was never the goal. These started as a series of blog articles based on my own experiences and what worked for me. The articles luckily clicked with readers and were noticed by Duckbill Books. It wasn’t until the book went in for a reprint that I stopped feeling bad for them for having made them into a book! I was confident that the book would languish in some dusty bottom shelf of a bookstore if at all. I just got lucky. You write about bullying, religious views, raising children with empathy and a lot more in your book. How did you decide on the topics for the chapters in the book? There was no conscious decision on my part. These were the issues that my boys or friends’ children faced. They were also the issues I constantly found cropping up in schools I was associated with. Which parenting book do you think has helped you in your journey? Honestly, none! I cringe at the term. There can be no parenting book! In fact, I squirm every time my book is called one. This is more of a journal of sorts, a collection of things that worked for me. A true parenting book would be a manual that would work for each and every child. But then, how can that be! Each child, each parent-child relationship, each parent is unique. One shoe can not fit them all. Parenting is a learning experience as long as we are open to evolving. Putting blinkers on, having rigid ideas, or being a helicopter – nothing works! One has to be balanced, be observant, see what works best in for the child’s well-being and most importantly one has to be calm and be there. As moms of the digital age, there’s obviously so much now that wasn’t a part of our growing up. According to you, which one thing can we change in the way we raise our kids, to leave them empowered with facing the world of their times? Let them fight their battles, encourage off-line interactions and equip them for failure – these I think would go a long way in empowering them. The boys did all their projects on their own. So while quite a few of their friends presented store-bought projects, they submitted poorly-made ones! They learnt to take responsibility for themselves fairly early. I am always there for them but I do not fight their battles for them. I am mostly there to nurse the wounds, help them re-strategise and prepare for the next battle. Your love for books is very well-known. What are your top tips for instilling a love of reading in children? There’s a whole section devoted to that in the book! I think for starters, making reading academic, outcome-based never works. Freedom to choose, to read (or not!) is more important. In the digital age, we are hyperconnected, yet isolated. What are your ideas on leveraging the strength of a society to raise our kids? As I said earlier, creating opportunities for informal offline interactions is extremely important. We live in isolation today. As kids, we grew up in a community. My neighbour would regularly deposit me at home and my mom never questioned her! I have a close circle of friends who were a part of the boy’s childhood. Grandparents are significant figures in their lives. So at any given point of time, they have quite a few people looking out for them. You are a writer, lecturer, a popular book group facilitator, a mom and so much more. Tell us how you divide your time between so many different things? I am the most disorganised person there is. I honestly have no idea how it happens. But it does. Thankfully, I have a full army of friends out there who help me get through it all. How did your 2 boys react to your book? I have a few picture books lined up. Recently, I wrote for the DK Indian Icons series. It was an entirely new experience to work on C V Raman’s biography! I hope to write more and write often. Finally, what is your everyday mantra to keep calm? Gratitude carries me through. Some days can feel like a devil’s handiwork but at the end of the day, I am grateful for the life I have, for the ups and the downs. If I were asked to go back to the past and change something, I’d draw a complete blank. ‘Keep Calm and Mommy On‘ is published by Duckbill Publishers and is available on Amazon. Also Read: What does Eczema look like for a child? Book Review: I have Eczema…; So What?